But because some of the new exploration is in the watershed of the Boundary Waters Canoe Area Wilderness, it's raising concerns among residents and other observers. The project will be ready for regulatory environmental review in three years, predicts Duluth Metals project manager David Oliver. When it's running, a mine tapping into the resource could employ 400 people for decades, he says. 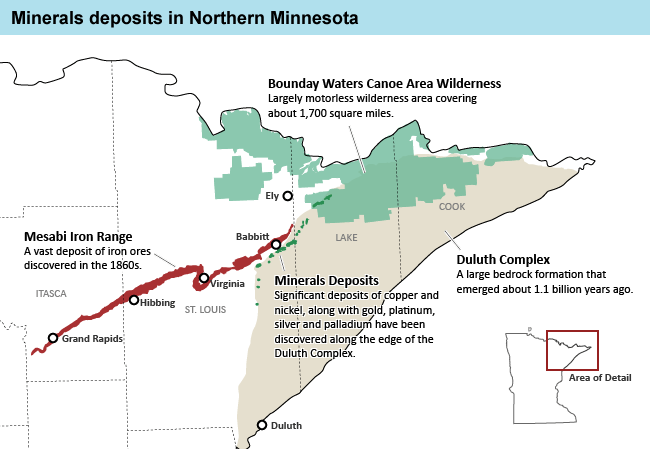 Duluth Metals is one of three companies actively exploring for minerals near the boundary waters. The companies are drilling deep holes, probing huge deposits of valuable copper, nickel, gold, platinum, and palladium. Steve Koschak, who runs the River Point Resort, is among the people worrying about that. A trickle of water runs from a six-inch hole Duluth Metals is drilling some 3,000 feet into the earth, seeping into a pit that holds water and a scum of grey muck, finely ground rock from deep in the earth. Koschak says it probably contains copper and nickel traces. "But look what it's going into, a wetland," he says. "That's all this is, is a network of spruce swamps, all interconnected, this all goes into Birch Lake, all this water." When the drilling is done, workers will bury the muck on site as required by the state. 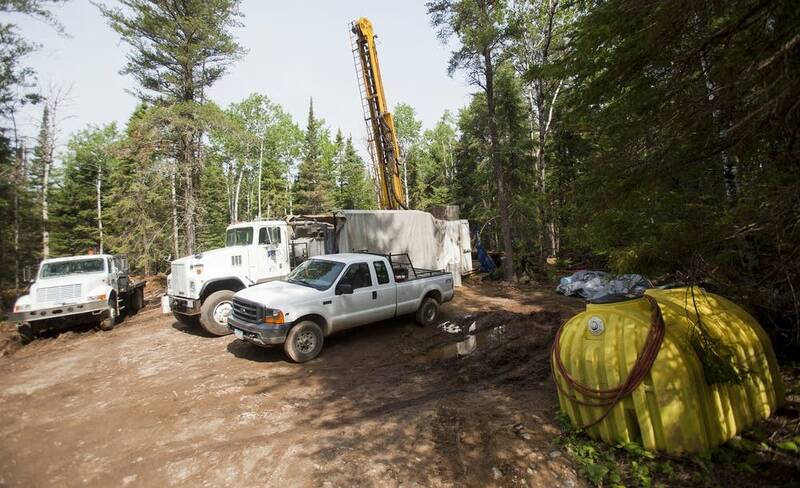 Duluth Metals says there won't be enough mineral waste to be any cause for concern. The drilling is a precursor to what could be a deep shaft mine, more than half mile below the surface of the earth. A mine would produce many tons of ground-up waste sulfide rock. When it's brought to the surface, a chemical reaction occurs that produces sulfuric acid. If the rock is not carefully isolated from air and water, it can acidify nearby streams and wetlands -- possibly enough to poison the life in the water. In many mines, discharges also contain traces of heavy metals such as lead, arsenic and manganese. The problem is called acid mine drainage, and it's happened wherever copper mines have been drilled. The advocacy group Friends of the Boundary Waters Wilderness recently organized a canoe trip for reporters, to show the proximity of the drilling to the wilderness area. Guide Jason Zabokrtsky pointed out that the drilling is about three miles south of the edge of the Boundary Waters, just where the river turns north and flows into the wilderness. "Into Fall Lake, then Newton and Basswood Lake, across to upper and lower Basswood Falls, into Crooked Lake, into Iron Lake, across Curtain Falls, and into Lac la Croix, all really well-known Boundary Waters lakes," Zabokrtsky says. Bob Tammen lives in Soudan and has vacation property on the South Kawishiwi River. 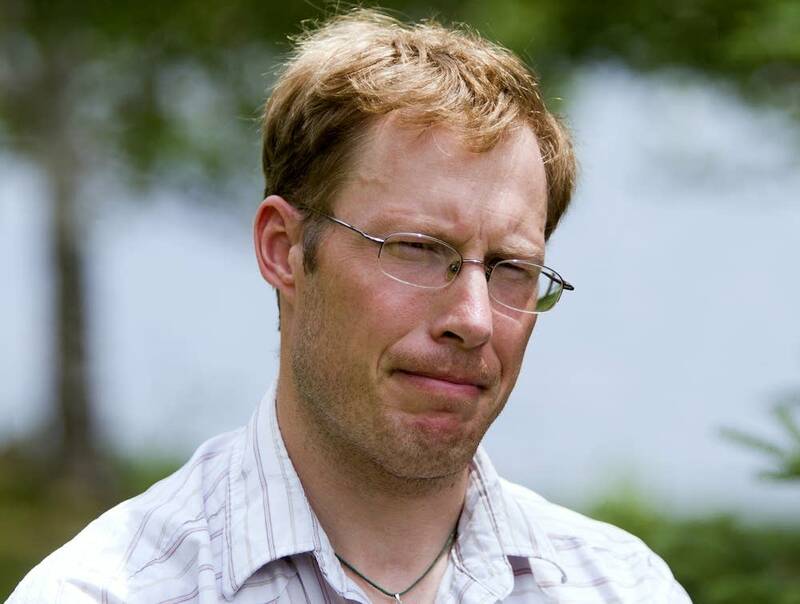 He doesn't trust the state to protect the environment because it hasn't been able to completely clean up pollution from the Dunka pit, a waste site from a taconite operation that 50 years ago accidentally exposed sulfide rock and ever since has been leaching metals into a nearby creek. "We've been trying for 30 years to get the Dunka site cleaned up. My contention is, if the state of Minnesota, working with the mining industry, can't clean up a mining site in 30 years, why should we ever grant a permit for a copper mining operation? We know that copper is generally in sulfide ore bodies, whereas our iron mining industry is generally in oxide ore bodies, which is not as damaging as sulfide." State officials say the Dunka problem happened before rigorous rules were imposed on mining operations. The Minnesota Pollution Control Agency's Ann Foss says it's difficult to solve an unexpected problem, but the experience at Dunka has taught the agency a lot about how sulfide rock reacts when exposed to air and water. She says that experience will help inform environmental reviews of any sulfide mining proposals. The Friends of the Boundary Waters has backed legislation at the state level to beef up requirements on financial assurance -- similar to the escrow fund that oil company BP has agreed to set aside in the Gulf of Mexico. Last year the Minnesota measure died in committee. Some of the neighbors here, around the edge of the Boundary Waters want to go further: they want the state to prohibit sulfide mining unless a company can point to one place in the world where a mine has operated without polluting water. Since a similar law passed in Wisconsin, no mines have been built in the state. The exploration is happening on the southwest edge of the Boundary Waters. Fifteen miles to the west is the town of Ely. 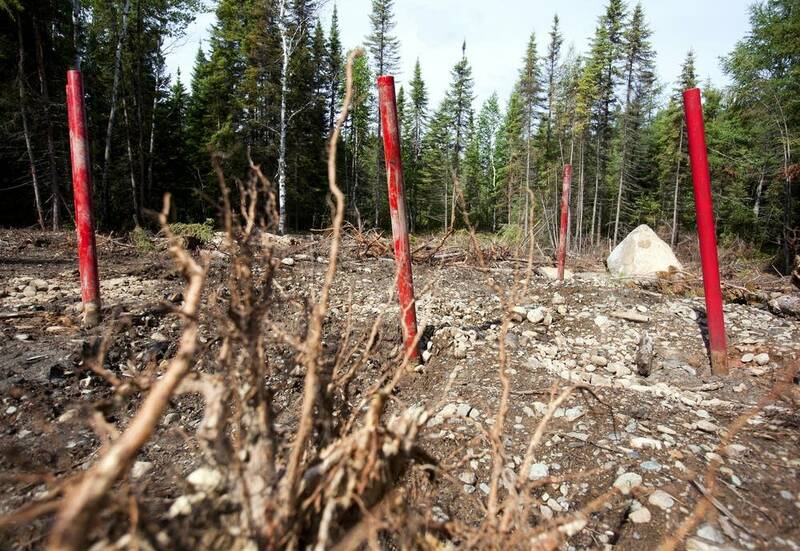 There are varying opinions in Ely on the exploration and possible mine development. The area has long been dependent on jobs in mining, logging, and tourism. Some people are excited about a new source of good-paying jobs. They still remember when an underground mine down the road in Soudan used to ship tons of rich iron ore. It closed in 1962 and now is a state park. Duluth Metals has an office in Ely, in a house on a quiet street. The walls are covered with colorful geologic maps, and in an attached garage there are lots of core samples from those drill sites down the road. Copper and nickel and the associated precious metals are used in everything from electric wires and computers to catalytic converters and rechargeable batteries. So demand is going up all the time. The combination of higher prices and improved technologies to recover the minerals is generating new excitement about a deposit that geologists have known about for a long time. Oliver discounts worries about polluted groundwater. He says the core samples are solid, nearly free of cracks, so it wouldn't be easy for any polluted groundwater to travel through this ancient rock. And he says the waste rock will contain so little sulfur that the kind of pollution that has occurred at other mines is unlikely. "This is deemed below any threshold that would generate acid drainage. It just doesn't have enough sulfur to do it." Until recently, a different company -- Polymet -- was the front-runner in the race for copper-nickel in Minnesota. 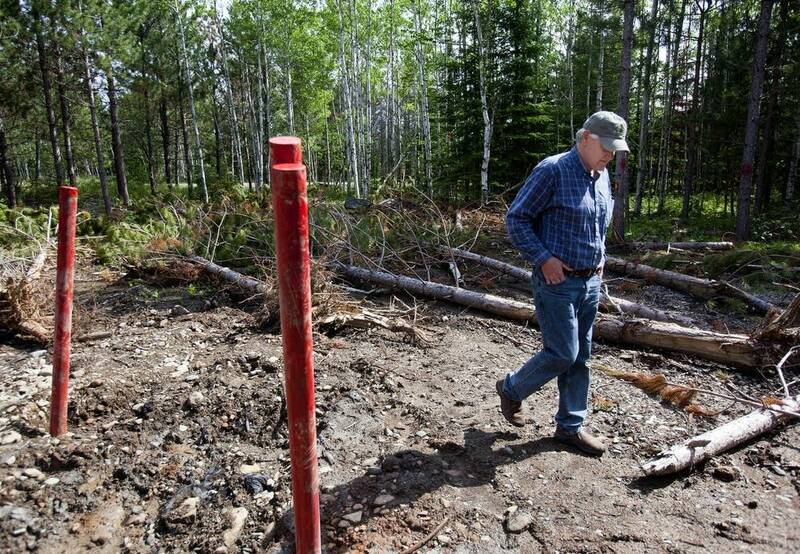 Polymet's property is just south of the land Duluth Metals is exploring. The Minnesota DNR and the U.S. Army Corps of Engineers did a draft Environmental Impact Statement for the Polymet project. But the federal Environmental Protection Agency did a scathing review of the work, saying it was inadequate. It will take more than a year to re-do it.